The Cardio Pharma Profile is a pharmacogentic report that identifies the medications commonly used for heart conditions that may be ineffective or have undesirable side effects. 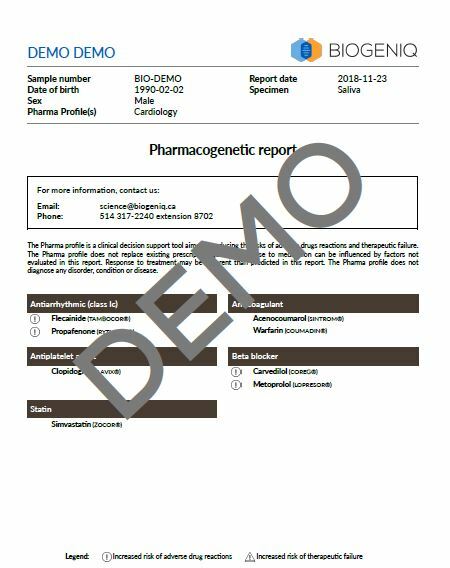 Are you curious to see what an Cardio Pharma Profile report looks like? Each page of the report covers information related to one medication. Please note that the version your doctor receives will be slighty different from the one you receive, with more technical details with respect to dosage and medication choice. Click on the button below to get a sample report.